Some people like to relax with a cold stiff drink or at a massage parlor. 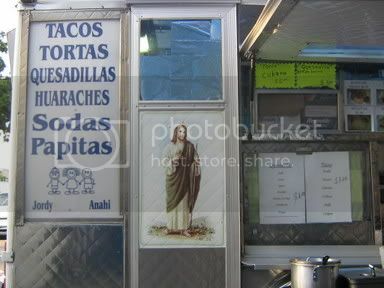 I like to relax by sitting at a taco truck with a plate of tacos and a lime jarritos. I can relax by doing those other things as well but this is a family friendly taco hunt. So that's how I ended up at the Los Panchitos taco truck at the corner of Venice and Bonnie Brea on a friday afternoon. An early start to the weekend and in search of some relaxation. I ordered two asada tacos and one al pastor. 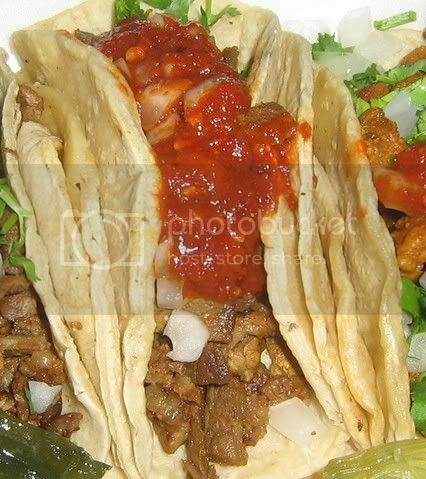 Lately I've been sticking to this formula when ordering my tacos because the best way to gauge the quality of a taco truck is to sample their best cuts of beef and pork. 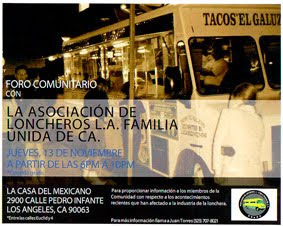 Los Panchitos serves the pico-union community and does business under the shadow of King Taco which is less than 1/4 mile away. 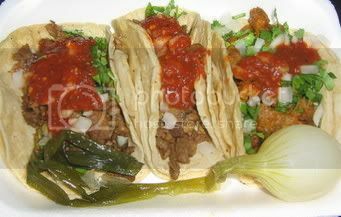 You can enjoy tacos, tortas,mulitas as well as complimentary frijoles and grilled green onions which you'll find in large tins on a table as well as a salsa roja and verde in containers packed into the ice compartment of the truck. With the downtown LA skyline creeping overhead I sat back and enjoyed my plate of tacos. The beef, finely cut and lean went well with the chile arbol based salsa.The pork was soft and although there was some pork fat I am beginning to believe this isn't always a bad thing. You won't catch me wearing a pork fat rules t-shirt but I can deal with a little pork fat. The tortillas could have used a little pork fat. As luck would have it they were dry and wilted.With some well oiled tortillas these would have been much better tacos. Having said that they were still good tacos but it goes to show how important every part of the taco is to the overall taste. I'll be back to Los Panchitos to try the mulitas and other items on the menu.It's a convenient taco truck stop coming out of downtown to avoid the freeway traffic jam. Now, what I can't understand is why you wouldn't be all about the Tamarindo Jarritos, doesn't that just seem like the proper drink for a taco? Lime is good but I believe the Tamarindo is the perfect balance to taqueria fare. But i guess, to each their own! Wow, Bandini, thanks! I'm away from your blog for only a few days and return to a wealth of new reviews! Glad you are back to your lean, mean, taco-munching and rating machine. Tamarindo is a good drink but I think it fares better with dry or fried foodstuffs, like chicharonnes or fried chicken. I prefer a Corona or a cold Coke (no ice) with my tacos. On another note, why doesn't Bandini try some Sesos tacos, some trucks always manage to surprise me with their brainy taste. If a taco stand can make good sesos, they can make almost anything. Hey Bandini! Another excellent review! One of my friends said that this site has saved his life!! He refers to it constantly for lunchtime info. My idea of the perfect 4th of July backyard party is to hire one of these stellar taco trucks to pull up the driveway in my backyard and serve my party guests, while we drink margaritas and cervezas and dance the night away! Happy 4th of July to you!